Opinion: No One Energizes the Republican Base More Than Donny Jr.
What President Donald Trump has been able to accomplish in such a short time is incredible, but he has not done it alone. Although a coterie of characters have been in his corner backing him up against an unprecedented establishment onslaught from the start, none of them have been more effective than his oldest son, his namesake, Donald Trump Jr.
Trump Jr. showed his prowess last week in the Wolverine State during a campaign event for U.S. Senate candidate John James. James, a fighter pilot and African-American business owner in Detroit, is not your typical Republican politician, and this was not your typical Republican event. Whereas the normal Republican event features grey hairs nodding off during stale speeches recited by boring party apparatchiks, this event was held in a giant airplane hanger and had the energy of a rager. Trump Jr. rocked the stage with the lovely Kimberly Guilfoyle, delivering a talk that retained his father’s off-the-cuff gags but combined them with a highly articulate and disciplined underlying message. Like his father, Trump Jr. knows the power of the meme. As the political establishment scrambles to scrub memes from the internet, Trump Jr. actually incorporates them into stump speeches. While speaking yesterday, Trump Jr. referenced the “Abracadabra” meme to contrast his father’s job growth with Obama’s incorrect prediction that economic stagnation would be the new normal. Trump Jr. understands the political potential of these viral internet trends and is sticking to the formula that put his father in the White House. Every individual left the night’s event with a handful of swag and a smile on their face. 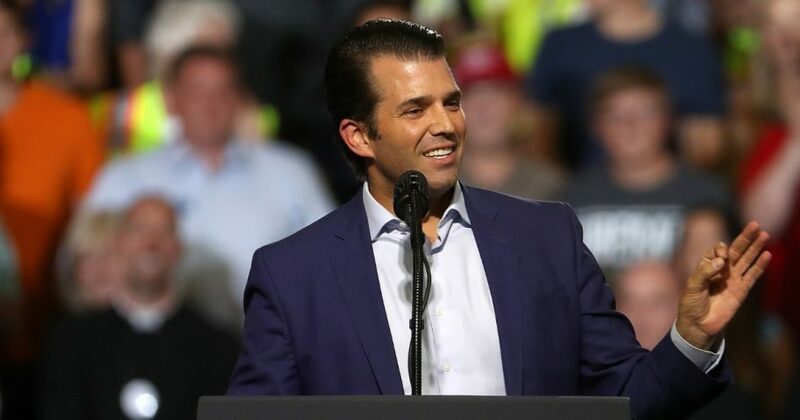 Although they had fun, Trump Jr. was also able to maintain a tremendous message discipline, drumming in the need for the crowd to show up at the polls and encourage like-minded friends and family to vote. In addition to Trump Jr. and Guilfoyle, the event also featured state-wide candidates including Attorney General hopeful Tom Leonard as well as incumbent Mike Bishop and upstart Lena Epstein — two Republican congressional candidates facing serious challenges from well-connected former Obama officials. But the crowd popped the hardest for local rock legends Ted Nugent and Kid Rock as they took the stage. These prominent entertainers have always been Republicans, but they were never as involved in the party mix before the Trumps took over. They may have voted for Mitt Romney and John McCain, but the marriage between these establishment figures and the populist free spirits always felt forced and unenthusiastic. Trump, on the other hand, truly embodied the very same straight-talking, down-to-earth ethos that animates them. We Michiganders have all seen staunchly blue union-dominated areas flip red miraculously, the Reagan Democrats re-emerging as a force to be reckoned against, and now, with the rise of Kanye West, even the inner cities are joining the fun. The momentum is building rapidly, and while Trump Sr. handles presidential business from the White House, his son leads the grassroots right behind him. As exciting as these developments may be, we should never put the cart before the horse. We will know on Nov. 6 if the Trump formula of populist energy, spliced with Atlantic City showmanship and hard-hitting attacks, translates into a winning formula in the GOP. Are you a fan of Don Jr.? The elder Trump can certainly carry a ticket when he is at the top of it, as the establishment learned to their horror in 2016, but it will remain to be seen whether the phenomenon can continue during a midterm election. Trump Jr’s power as a surrogate will be tested too by the success of the James campaign and other candidates he has directly promoted throughout the country. Regardless of the election results in November, our politics has been changed forever and we must learn the lessons that the Trump family has taught us along this wild ride. What the Trump family understands — a perception that is a constant blind spot for all those well-paid politicos in ivory towers throughout Washington, D.C. — is that politics is a show. You do not win with boring policy talks consisting of generic talking points prepared by some soulless corporate think-tank. Republicans lost for years following that dismal formula. Indeed, we almost lost America due to the failures of the old, stale conservatism of the party elites. The new conservatism, which understands politics is about the art of the performance, featuring Trump as ringmaster and Trump Jr. as lion tamer, has already achieved the impossible. Going the extra mile and moving mountains for a Republican victory between now and election day, to ensure America remains first at home and abroad, pales in comparison.